there is a releated thread at forum.marquisbroadcast.com/12-x2pro-professional/1544-fcpxxml-to-aaf-error.html#5694 . And I also tried the iTunes movie DRM tool you listed, I edited the converted MP4 at Final Cut pro, it can do it easily. Thanks! From all answers, I guess that you have known the reasons why error occurred covnertting Final Cut XML to AAF. Here, giving you an extra tip for using Final Cut Pro more convenience that editing iTunes movies on Final Cut Pro. It's well known that iTunes movies and TV shows are protected by Apple's FairPlay DRM technology, which limits iTunes users to use iTunes files freely even if they have purchased them legally. But don't worry. You can meet iTunes DRM M4V Converter , which can break DRM protection and convert iTunes M4V to FCP compatible formats, like MP4. After that you can start to edit iTunes movies on Final Cut Pro without any limit. For editing iTunes music, Apple Music and Audible audiobooks on Fianl Cut Pro, you can refer to Apple Music Converter for Mac . Thank you for the response and it is great to hear the problem was resolved in the 3.0.5 release that is on the App Store. I will send you a FTP location via email for you to upload the sample file for us to have a nd test with in the future. And I did not use X2pro earlier, so I don't know if earlier versions were able to export HDV. Jeremy Norwood wrote: Would you provide your latest FCPXML and the error message that you get in X2Pro that makes you think that your HDV clip that plays in QT 7 is not supported in X2Pro.? Also, could you provide us with one of your HDV clips for us to look at? 1 last question, did these files work inside of X2Pro version 2.5.1 or an earlier version or do you know? After 18 hours of manually transcoding and re-linking on the weekend I deleted all the old non-functioning xml's. After I transcoded every HDV-Clip to prores the export finally worked. This is a long-term-documentary with different formats and one half of the footage is HDV. It works with HDV and I can't reproduce the error now. I will send you an HDV clip. This is from a JVC Camera. JVC uses a different kind of HDV than Sony. This is 720p25. Just tell me how I can send it to you. It is too large for this upload. Would you provide your latest FCPXML and the error message that you get in X2Pro that makes you think that your HDV clip that plays in QT 7 is not supported in X2Pro.? So I narrowed it down. Apparently X2pro doesn't like the audio from HDV although Quicktime 7 can play it. I will transcode to Prores AND transcode the audio as well and re-edit. What kind of audio file was this? MichaelGrant wrote: Was finally able to fix the problem with my audio conversion. Explained the problem to a friend of mine who deals with post sound a lot. He recommended that I isolate each track of audio in separate final cut timelines, export separate Xmls of each track to identify the problem. Turns out the problem was with a bit of audio we had recorded on the boom on set. The soundtrack and ADR tracks all converted fine, but that one piece of dialogue wouldn't convert. Had to find the original file, import it into iTunes and then cut it back into the edit in final cut. Got the project to convert properly to aaf and sent it off to my sound mixer. Did a bit of research though and found that x2pro is not compatible with audio that is not supported by QuickTime 7 for whatever reason. Hope this is somewhat helpful. What kind of audio file did not work? Can you give me the specs? I tried this already yesterday. The xml seems to be to large for this upload! So what can I do now to give you the fcpxml? Was finally able to fix the problem with my audio conversion. Explained the problem to a friend of mine who deals with post sound a lot. He recommended that I isolate each track of audio in separate final cut timelines, export separate Xmls of each track to identify the problem. Turns out the problem was with a bit of audio we had recorded on the boom on set. The soundtrack and ADR tracks all converted fine, but that one piece of dialogue wouldn't convert. Had to find the original file, import it into iTunes and then cut it back into the edit in final cut. Got the project to convert properly to aaf and sent it off to my sound mixer. Did a bit of research though and found that x2pro is not compatible with audio that is not supported by QuickTime 7 for whatever reason. Hope this is somewhat helpful. Last Edit: 3 years 5 months ago by MichaelGrant. Here is the text from the console. The computer was saving the file automatically as a .log file but I was unable to upload this type of file so I changed it to a .txt file. Please let me know if you need me to send anything else. Thanks so much. Can we get the text from the console, and not just an image of the text, please? Great. Just did the attempted conversion again. Still getting the same message. 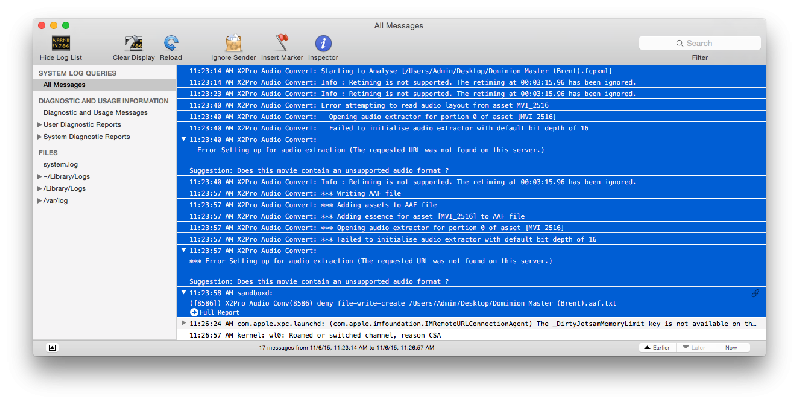 Here is the information from the Mac console log attached in a screenshot. I have also attached the xml that has been giving me the issues. Let me know how to proceed. Thanks for all your help. Would you upload your FCP XML for us, and would you be able to provide the Mac console log details from your attempted conversion? It may be easiest to open Console, clear the window, then try to run the conversion in X2Pro and copy out the lines of the console for the conversion and put those into a text file and send to us. Please let us know if I need to explain myself better.